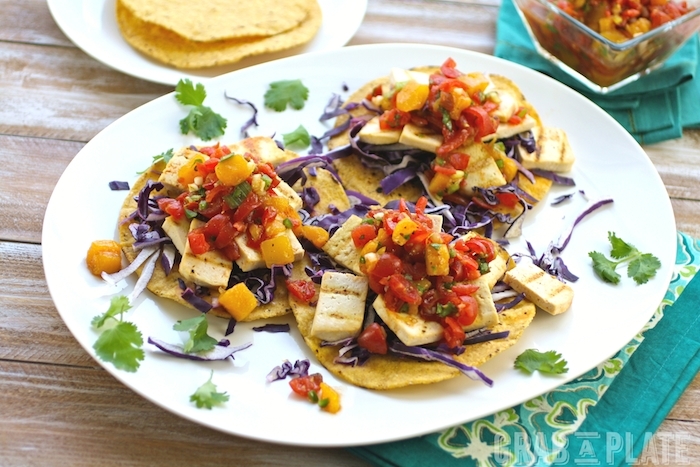 Grilled Tofu Tostadas with Tomato-Mango Salsa offer an easy-to-make meal option that’s bursting with flavor and packed with protein. It’s the perfect dish to serve on a hot day. I was trying to come up with something to make for a Meatless Monday dinner that didn’t require much firepower. Even though summer is winding down, here in Phoenix, we’ve had near record-breaking temperatures of 115-117 degrees F. Crazy, right? Phoenix summers can compare to the cold and snowy winters some of you live through – at least in practice. We stay in (for the most part) during the unbearably hot summer, like some of you do in the winter. For this reason, my grill pan is my BFF in the kitchen this season, and I’ve used it a lot. I don’t think I need to tell you that no one wants to be outside cooking over an open fire in this weather, and the oven doesn’t hold much appeal, either. I wanted more than a big salad for dinner, so I decided to break out the stovetop grill pan to make Grilled Tofu Tostadas with Tomato-Mango Salsa. It was the perfect option on a scorching day. 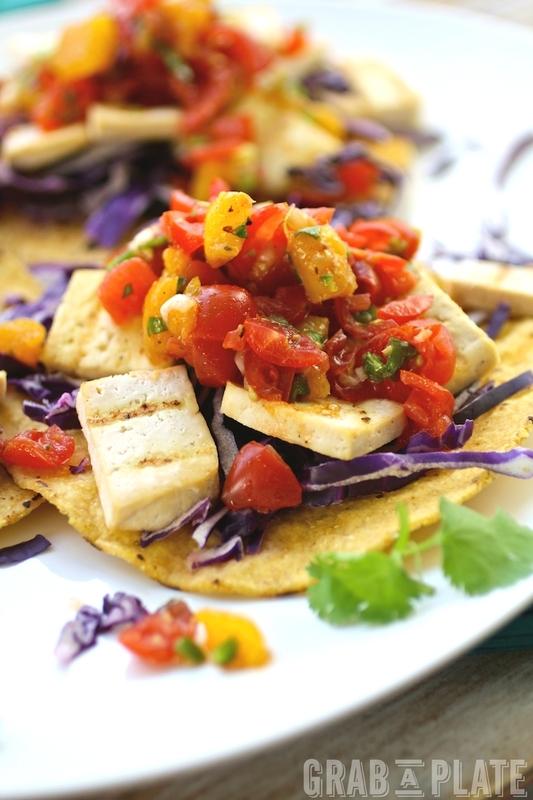 Grilled Tofu Tostadas with Tomato-Mango Salsa have a bunch of great elements to offer: sweet-and-spicy salsa, soft and hearty tofu, crunchy cabbage, and crispy tostadas. This is a colorful dish that is delicious on a hot day. Crack open a beer or squeeze some lemon in your iced tea and enjoy the flavors, textures, and colors that are waiting for you! Grilled Tofu with Tomato-Mango Salsa has so much of everything good -- texture, color, flavor -- and it makes a great Meatless Monday meal, too! Combine the tomato, mango, green onion, jalapeño, garlic, cilantro, olive oil, lime juice, chili powder, salt, and black pepper into a bowl. Toss gently to combine. Taste and adjust seasoning as needed. Refrigerate until ready to serve. Slice the tofu into pieces about 1/2-inch thick and 3-inches long. Place a grill pan over medium-low heat. When hot, brush with the vegetable oil. Add the tofu slices to the grill pan and cook for 3-4 minutes on each side until lightly golden and grill marks form. Evenly divide the purple cabbage between the tostadas. Add several grilled tofu pieces to the cabbage. Use a slotted spoon to mound the salsa over the tops of the tostadas. Use leftover salsa to enjoy with tortilla chips. Use any leftover salsa (or make extra) to enjoy with tortilla chips! Oh my gosh that looks SO good!! Thanks and I've Pinned it for keepers!! Thanks so much! Hope you give it a go and enjoy! I have never tried tofu, but I am not a huge meat fan (other than chicken). This looks really good! Oh! I hope you give this a try, Logan! Thanks for stopping by! Lovely - they look really tasty as well as healthy. What a beautiful and refreshing lunch this would be! I'm picturing inviting my girlfriends over and enjoying this on the deck with a big pitcher of lemonade! Yum! That is a good idea, Sara (unless of course you live in Phoenix -- too hot right now)! Thanks for you kind words! Yum, this sounds fantastic! Love the colours! So fresh and colorful! I love tostadas! so pretty! i bet tempeh would be great too, yes? I love tempeh. Me too, Lindsay! Funny you say that b/c I picked up a package of tempeh for this recipe and changed my mind at the last minute! Will need to try it! this looks so good! I recently stopped eating meat again.. so this will be a great weeknight meal for me! Thanks, Lauren! Hope you give this a try and enjoy! This is perfect for a hot day because meat can be so heavy and the salsa is perfect. So true, Janette! Thanks for stopping by! Such a fresh looking salsa. What a great vegetarian recipe? Thank you! These look out of this world, absolutely delicious! This is a recipe, that I want definitely make soon! The flavors, the salsa, count me in! Your pictures are so bright and colorful just beautiful! Thanks so much, Florian! I love that they're so easy, too! I was just telling my husband that I need to try to cook with Tofu! Maybe this will be my first recipe! This looks DELICIOUS! Oh, you should, Becky! Let me know if you give this a try! Pictures make this look amazing. Yummy!!! Such pretty colors and vibrant flavors! I am all about these tostadas! 115 degrees? Whoa. I wouldn't be able to handle it! Well being pregnant definitely has made my love of summer come to halt! And the idea of a dinner that doesn't require much heat is ideal, even here in KC! I know - it's crazy, Meg! I don't know how we all survive, I really don't! Hope you're feeling well! Love this salsa! Would definitely have to double it so that I could enjoy it by itself as well! OH.. Phoenix, i was there a couple weeks ago and holy moly is it hot! Like you walk outside and sweat.. and i'm from houston! !These are genius and seriously look soo good! Wish I had them in front of me right now! Thanks, Krista! I must say, at least we don't have to deal with the humidity! But, yeah...super, SUPER hot!! I've never thought to try tofu in a Mexican dish.... this is genius! Looks so fresh and yummy. Confession, I have never worked with tofu, but this recipe might have me changing that. 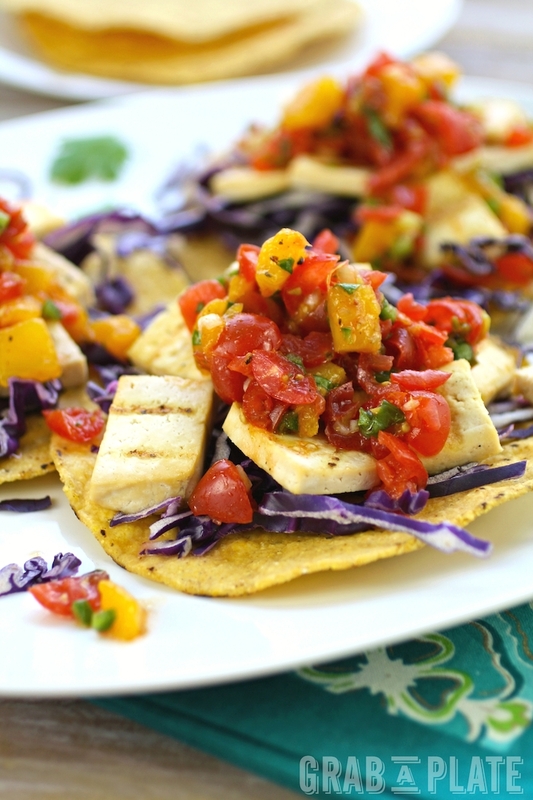 I love tofu and mango salsa! Very refreshing recipe! It is HOT over here in California too. The other day it was 105 F, I can't even imagine what 115 F would feel like. I'm pretty sure my eyebrows would burn off. Tofu like I've never seen it, it looks so beautiful and I want some right now! I'd love it if you came and shared this on my link party that's going on right now! Thanks so much, Amber! Will stop by! That's great, Samantha! Hope you enjoy! What a healthy and delicious looking recipe! Pinned and shared! 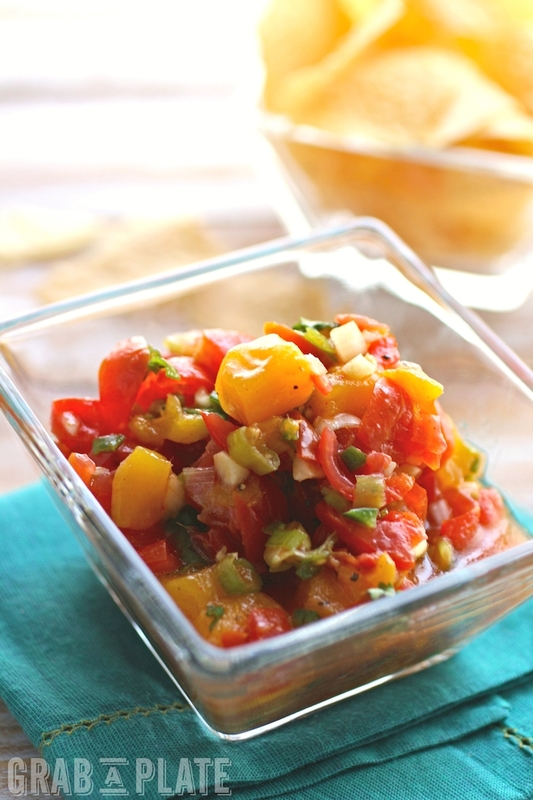 I make a mango tomato salsa veyr similar to this one, but with some rinsed black beans as well. I love mango in salsa, just can't get enough of it! Great idea using cabbage on the tostadas. Thanks so much, Sofia! I love mango, too. Sounds like the added black beans really makes a great salsa to dig into! I saw these on pinterest and loved them, the mango is such a nice addition, I also like the crunchy texture. Thanks very much, Katalina! Hope you give them a try! Love how colourful these tostadas are - and how delicious they look too! The salsa sounds amazing! Thanks, Catherine! It's great for summer! 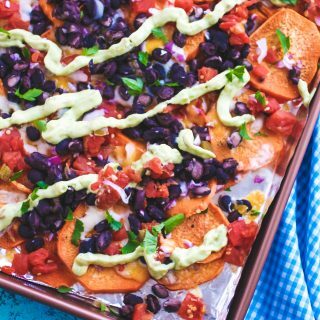 These look so delicious, love the mango salsa too. Thanks for stopping by #TryaBiteTuesday and sharing your delicious recipe! Pinned and shared - hope to see you back this week! These are beautiful and wow on those flavors! Fantastic recipe!!! These are so perfect for meatless Monday! Amazing sweet and savory dish. Love both the colors and the flavors of them. I really need to try your recipe!